Welcome to Day 1 of Food4ThoughtNYC’s 5 Shades of Apples aka Everything-you-ever-wanted-to-know-about-apples-but-were-too-afraid-to-ask! If you missed yesterday’s post, my mission statement for this week is to show you just how amazing apples can be by featuring it in five different recipes ranging from sweet to savory. From munching on a Gala to slicing up a Granny Smith for that pie, the apple is one of the most ubiquitous pieces of fruit around. I’ve been counting down the minutes today to rush home, put my pretty apron on, and share this first recipe for the week. You ready? Here we go! 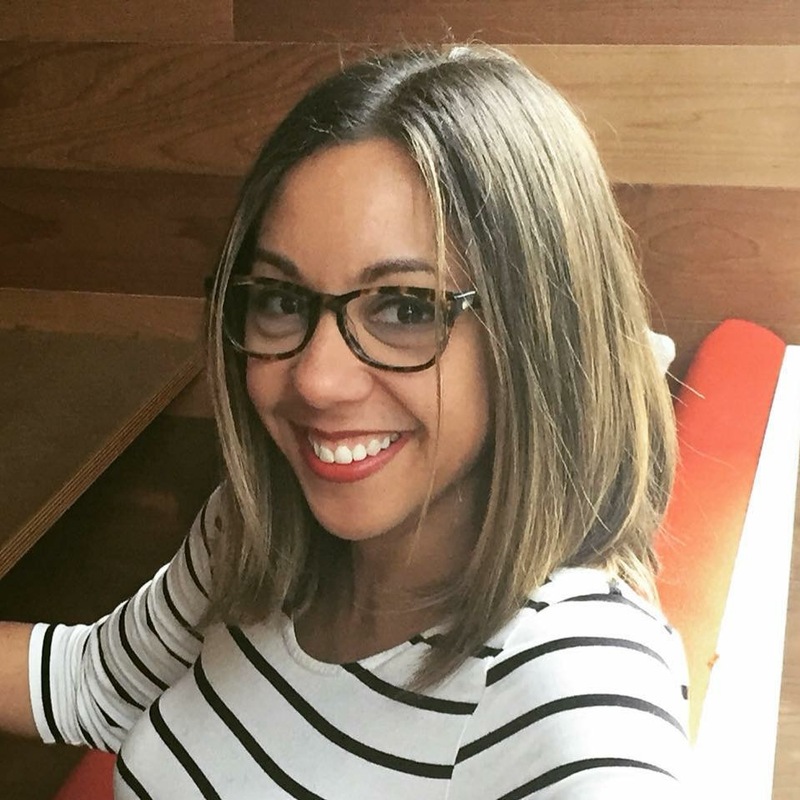 I really debated how to start off this week with so many wonderful recipes to choose from, but I decided to go for something classic and turn it on its head; something I love to do if you’ve been paying attention to my blog. I mean, who doesn’t love pizza? Also, it’s Monday and as much as I love a tarte tatin, I couldn’t start by baking. The beginning of the work week calls for comfort food, and there’s no better cure for a ‘case of the Mondays’ than pizza. So, apple pizza huh? Yes, and having just eaten two slices, let me tell you, it’s DELICIOUS. 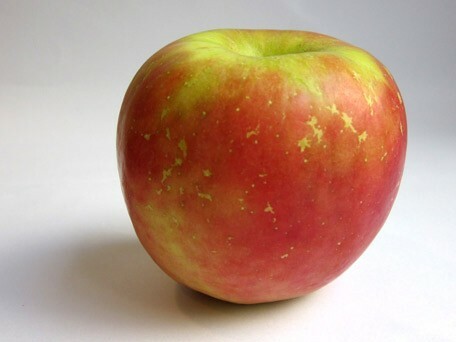 Tonight’s apple guest star is the Fuji apple. Fuji apples are actually a cross between two American varieties, the Red Delicious and Virginia Ralls Janet but they were first developed in Japan in 1962 and named after Mount Fuji. They tend to be medium to large in size with a light red/yellow or pink blush against a yellow-green background and lined with red vertical stripes. Fujis are crisp, juicy, sweet, and refreshing with a nice snap when bitten into. Fujis stand up well to cooking due to their thick skin and dense flesh. They can be sauteed, baked, roasted, and boiled. Since they require so much sun to properly ripen, fujis are not grown commercially in northern US which is why my Fujis came from New Zealand. They are also a late-ripening variety and are available in November/December in the Northern Hemisphere and May/June in the Southern Hemisphere. Now that we’re all a bit more educated on the Fuji, let’s take it for a test drive. It’s pizza time! Notes and Alterations: I used store bought multi-grain pizza dough from an Italian bakery in the Bronx, NY and its outstanding, so I figure why mess with perfection by botching my own dough? If you have access to a local Italian bakery, I suggest you do the same. If you’re an adventurous sort or have superhero skills with pizza dough, then I applaud you and I encourage you to have at it. For all my gluten-free friends out there, try this pizza crust recipe from blogger Karina of glutenfreegoddess.blogsspot.com. Also, Bob’s Red Mill produces gluten-free pizza crust mix if you’re looking for a safe alternative to this wheat-based dough. I did not have any fresh thyme on hand, so I opted for Herbes de Provence in its place. 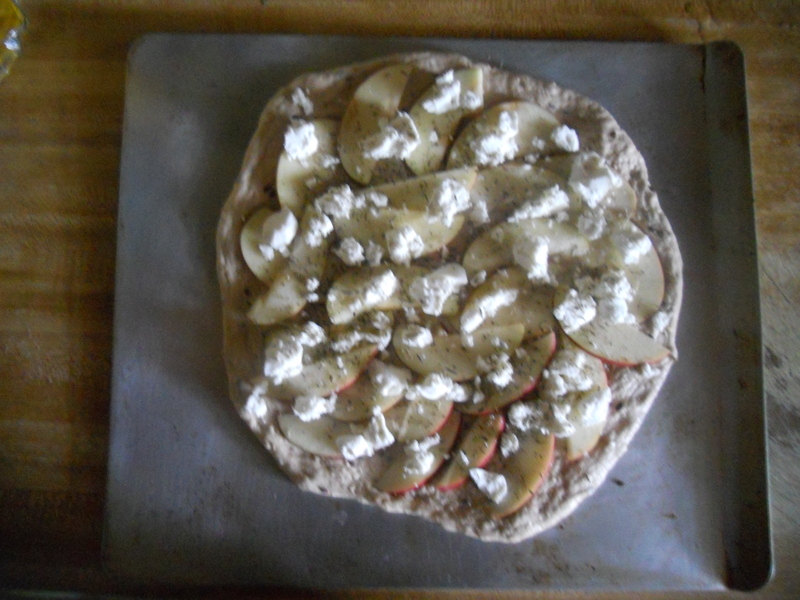 I love the way it tastes with goat cheese and I thought it’d work nicely with the apples. For those unfamiliar with Herbes de Provence, it’s a dried herb mixture of thyme, savory, fennel, basil, and lavender; a lovely mix of flavors and a great addition to your spice cabinet. This recipe is pretty quick, so you want to make sure you have all your ingredients at the ready because you don’t want those apple slices to brown once you start chopping. Preheat your oven to 450 degrees F.
First step is to prepare your dough. Whether it’s bought or handmade, you should place the dough in a lightly oiled bowl and cover with a towel for about an hour. This will make it far more pliable and easier to handle when you roll it out later. Next, slice up the apples. I cut back on the recipe a bit, so one large Fuji apple was more than enough for a 10-inch pizza. 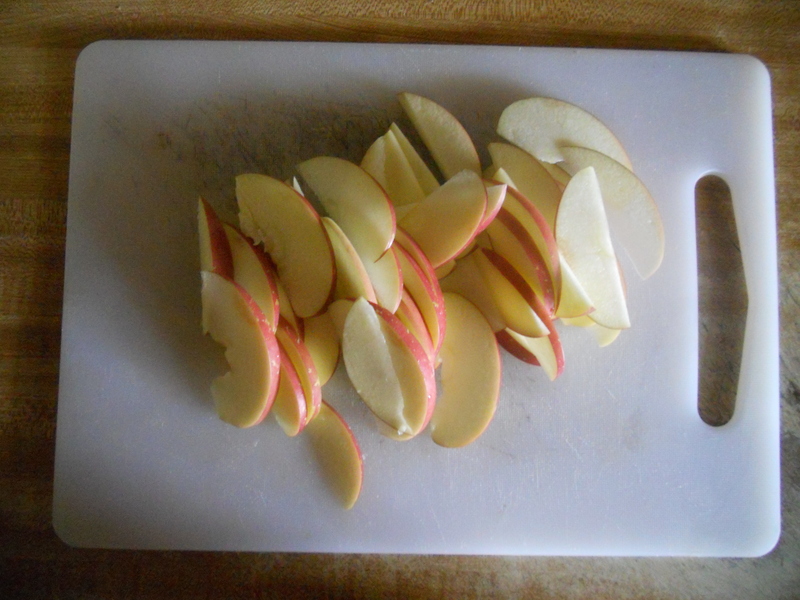 Core the apple, leave the skin on, and slice into fairly thin pieces. Now it’s time to do what we all dreamed of as kids; play with pizza dough. As nutty as I can be in the kitchen, I don’t quite have the courage to take dough and spin it over my head. I dream of the day when I can pull that off without batting an eye, but for now I’ll settle for the push and spread method with my fingers. By this point your dough should be easy to handle and still stretchy. Pull out your sheet or tray and get started stretching that dough out into a circle. You can practice stretching it by closing your hands into fists, placing them underneath the dough, and stretching it carefully with your knuckles. Or if you’d rather hear it from the experts, watch this video clip and see how a professional gets it done. It’s impressive. I’ve mentioned my love of kitchen gadgets in the past, but there is one gaping hole in my inventory. The pizza stone. A ceramic or earthenware flat slab that conducts heat from the oven directly into the dough, it’s said that the resulting crust is far superior than what you get from a metal or glass pan. One day I’ll own one and see for myself, but for now I’ll stick with my trusty baking sheet. Make sure your sheet is lightly oiled before you place the dough. Once it’s patted down into shape, place your apple slices evenly in a single layer and then top with crumbled goat cheese. Sprinkle about 2 tsps of Herbes de Provence on top and then it’s ready to go in the oven! Note: If you’re vegan, you can substitute the goat cheese for vegan soy cheese. There are a number of options out there, but you can start here with a review of best vegan cheese for pizza and try what works best. 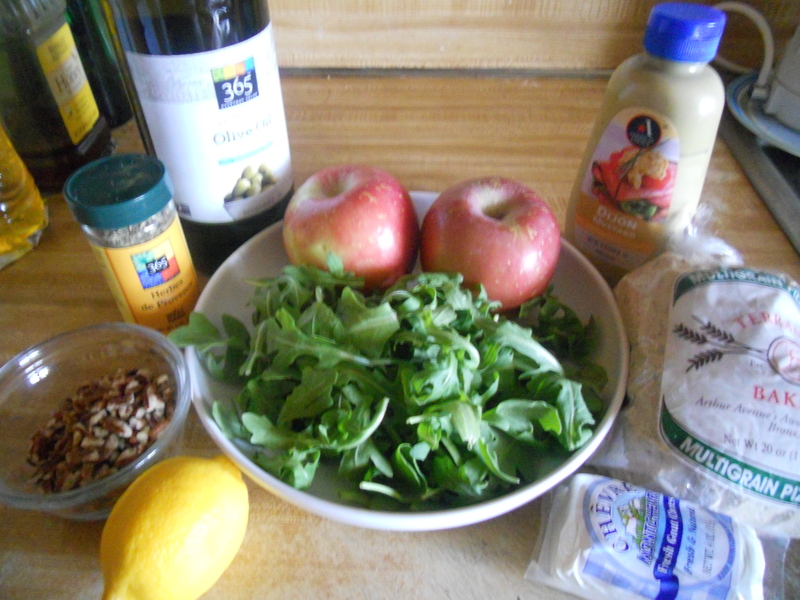 While the pizza is in the oven, make the simple dressing for the arugula. Mix the olive oil, Dijon mustard, lemon juice, and honey in a small bowl. I don’t like a heavily dressed salad, so I only added about a tbsp to the arugula and tossed. The pizza will only take about 10 minutes in the oven. Heads up: the smells coming from your oven will drive you absolutely nuts. Honestly, it was SO good my fingers were itching to take the thing out of the oven before it was ready. Better to wait though. You wouldn’t want to under cook your dough! 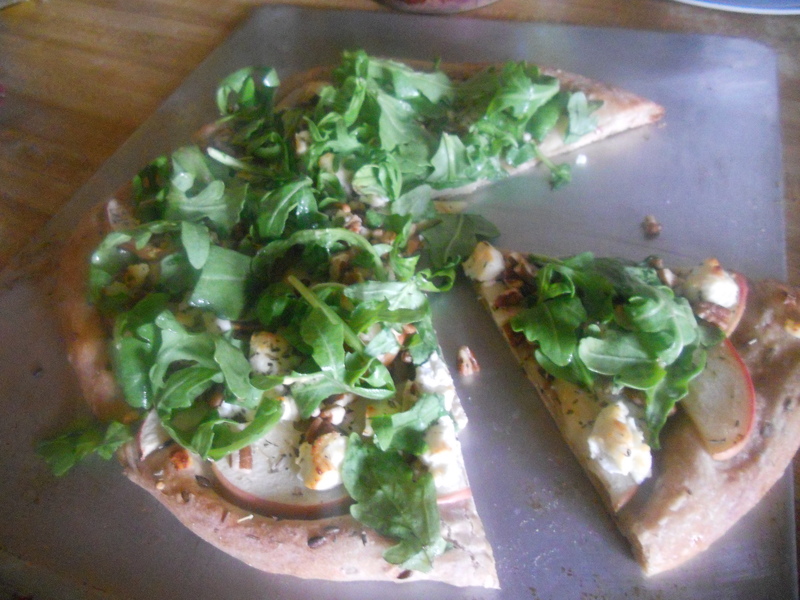 Once the goat cheese and crust starts to brown, the pizza is ready to be taken out of the oven. Quickly toast up about 1/3 cup of chopped pecans by adding them to a small dry pan over high heat for about 30-45 seconds. Sprinkle the toasted pecans first and then top with the dressed arugula. And then that’s it. You’re done! Super easy, right?! Now you have no reason to really believe me although I hope I’ve garnered at least a bit of trust with the recipes I’ve chosen in the past. This pizza was phenomenal. 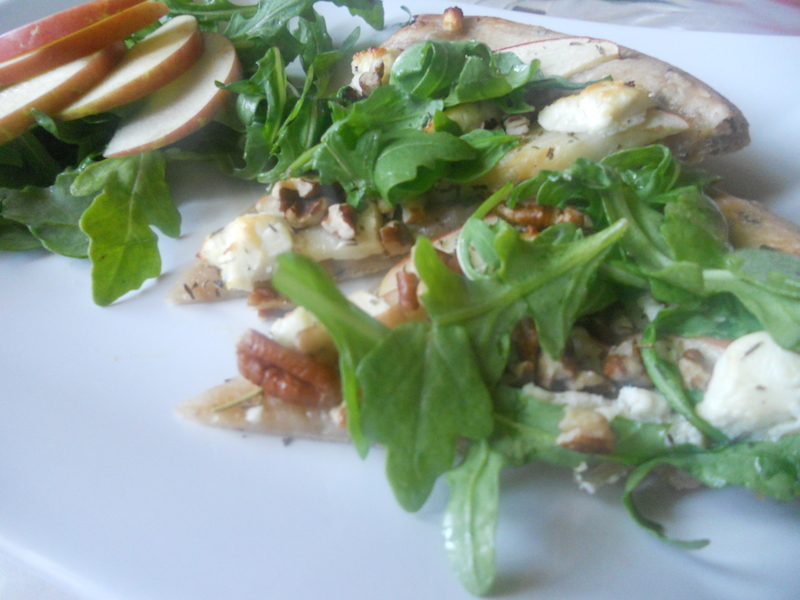 The apples were sweet and meshed well with the tanginess of the goat cheese and the peppery bitterness of the arugula. The lavender and mixed herbs from the Herbes de Provence helped balance everything out and gave it a different sweetness as well. It was SO good that I even got my brother to eat a slice. The guy who eyes onions with suspicion. He tried it because he loves me, but he ate it because he actually enjoyed it. That’s a winner in my book! This was my first time making something savory with apple and I was curious to see how it would all come together. I’m glad to say that this recipe was a great choice to start the week. Not only was it quick, light, and relatively easy, it was also a great showcase for the Fuji apple. Give it a try the next time you want to make a fast dinner and you have some leftover apples! China is the biggest apple growing region in the world, accounting for nearly half of the production of apples globally. Fujis make up about 70% of apple production in China. Stay tuned for Day 2 of 5 Shades of Apples tomorrow evening…. I love your apple flair! I am going to reblog this link to my reblog page! Love the apple series!